Wiseway pellet stove is in a class of its own, although it is technically classed as a pellet stove because of the fuel it burns. Wiseway feels that because their stove uses no electricity and operates like a wood stove, utilizing a natural vent and requiring no electricity as all other pelletstoves do, a new classification may be needed, but at this time Wiseway simply calls it a Non-Electric Pellet Stove. 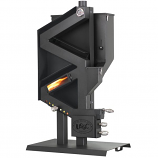 The key advantage to a wiseway pellet stove is no electricity lower operating costs, no noise with required augers and blowers found in all other pellet stoves, there again saving you hundreds of dollars in service calls and expenses in parts & replacement costs. Wiseway lowers your electricity bill by eliminating it all together.